Join the discussion on our forums! Come discuss Night Howler over in our dedicated Night Howler discussion topic. 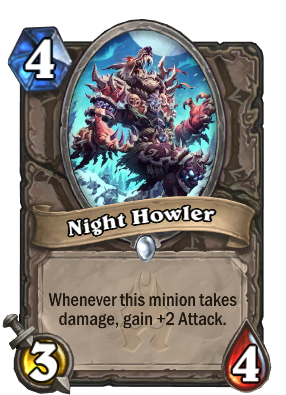 This card is kinda cool, if it survives even one turn, you can set up a really hell load of damage with it in Enrage Warrior. I do want Blizzard to buff it to 3 mana, though. It's kinda weak right now. Still - fun card. ARH-WOOOOOOOOOOOOOOO, oh again the howlin' ? Why doesn't this cost 3 mana? Why would you play this over Aberrant Berserker? Why is this in a premade warrior recipe and did Blizzard seriously think this card was that good enough to include it? WHY DOESN'T THIS COST 3 MANA?! Just change the gain damage to +1 instead of +2 and then you have a perfectly fine 3 mana card. It's actually insulting the way this card is stated, absolutely moronic Blizzard balancing. Not gonna lie, the first thing that popped into my head were the toxic flowers from Zootopia. I would have preferred this as a 2/5. Gurubashi Berserker is better than this in almost every instance. I don't think 1 more starting attack can make up for so much less health on a card that relies on being damaged multiple times to be good and a worse effect. Even at 1 less mana.